Then I Got To Thinking...: The Decorations Are Up! Marvelous decorations! 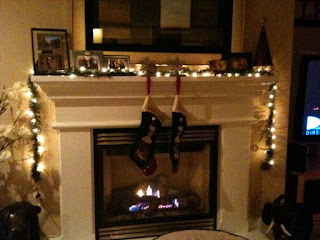 I put up my decorations over the weekend and love the lights around my fireplace! Love the decor - your place is looking gorgeously festive! Love the decor - your place is looking so festive!! Looks good! We got all our decorations up too! Doesn't it feel so cozy now? Everything looks lovely! 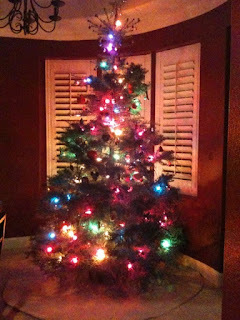 We haven't put our tree up yet (if we ever will) because of Batman this year, so I have massive tree envy! Oh, it all looks so pretty, how lovely!! Gorgeous...i love the baby tree! Looks beautiful! I need to get my stuff up asap! Love all of your decorations. The mantle looks awesome. Your tree is beautiful. I love the little Christmas trees. We also have one in our kitchen we had the best time finding ornaments for it! ahhhh!!! your place looks ADORABLE! love all the decor. i need a teeny tree like that for the pups. I just came across your blog! I love it! Your Christmas Decorations look great! Oh, how pretty! I can't wait for Mr. Potts & I get get our decorations up. That mantle shot just oozes coziness! ohhh its all so pretty!!!!!! The mantle looks great and I love your baby tree. That's such a great idea! Looks so pretty Tracy! Love the mantle!!! Love your decorations...and I'm a little jealou you have a fireplace. That is one thing we HAVE to have when we decide to move into a house. :) I gave you an award on my blog! Your place looks great! love the added baby tree in the kitchen! so cute. I love it - so warm and cozy. I am such a homebody right now soaking it all up! oh it's beautiful!! and so big!! it sooo pretty!!!! your cozy looks so cozy and warm!! Your tree and mini tree are lovely!! And I saw a bit of your chandeleir in the corner of the tree pic and I love it!!!! Ohhh everything looks just gorgeous sweetie! Love all of your lights and baby trees are just the best, huh? No worries about the e-mail, I know you have lots going on with the new job and holidays. Whenever you have the time! XO! 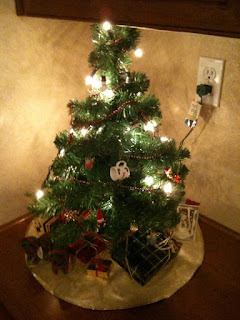 Aww love that you have a baby tree in your kitchen, too! So fun! We used to put baby trees all over the house when I was a kid.. I loved it! And gorgeous tree and mantle, girlie!!! Yay! I love your mantle! I need to decorate mine too. You've inspired me to decorate this weekend! Your decorations are just lovely! I love all the colors in the tree. Doggies need to be spoiled on Christmas more than any other day! Your mantle is stunning lady! And that baby tree. Dying. So cute! such sweet christmas trees....the spirit of the season has most certainly drifted into your home! For some reason that baby tree is my fave! Merry Christmas!